Currently, PMSE has some great community moderators, many of whom are regular visitors and contributors. Unlike some other sites on the network, I think our moderators have the full support of the PMSE community behind them, and consistently take moderator actions that are fully supported by our active community. However, as a beta site, we still have a fairly small group of active users with sufficient reputation to close or re-open questions, or to handle other types of flags when needed. (Note: There used to be a page that showed how many users had what privileges, but I can't seem to find it any longer; links to that page would be welcome, if it still exists.) Rightly or wrongly, I subjectively feel like we're getting busier as a site, which is great, but we currently only have three diamond moderators assigned to the site. I'd personally like to see us add one to three additional moderators to PMSE. Whether by election or appointment, I think having a few additional moderators would help keep the site running smoothly and help us manage an increasing number of closures and flags as we continue to grow our site and our community. [Feature Request] Can the community choose to add additional moderators? [Process Discussion 1] If it's possible to do so, and if the community agrees that it's a good idea, how should we initiate that process? [Process Discussion 2] If we initiate that process, how should we proceed with implementing it? Item #1 is really up to the Stack Exchange admins, but I'd really like to see the entire PMSE community take part in discussing these issues, especially the second and third items. The Privileges page is now part of the Help Center, and can be broken down into four categories. One of the challenges a Stack Exchange beta site must overcome is gaining passionate contributors. To succeed, the site cannot rely on diamond moderators alone. Instead, users who have reached certain moderation privilege thresholds would step in and help keep the site clean and on topic via editing, voting to close and reopen, flagging, retagging, etc. 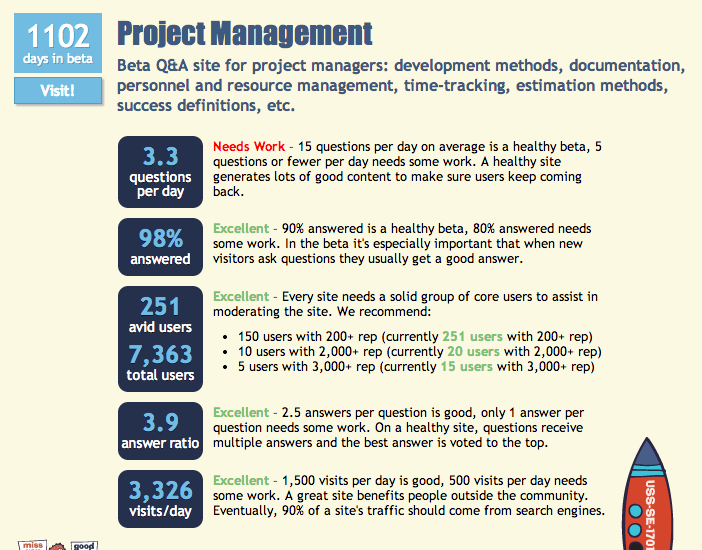 Project Management Stack Exchange is a question and answer site for project managers. 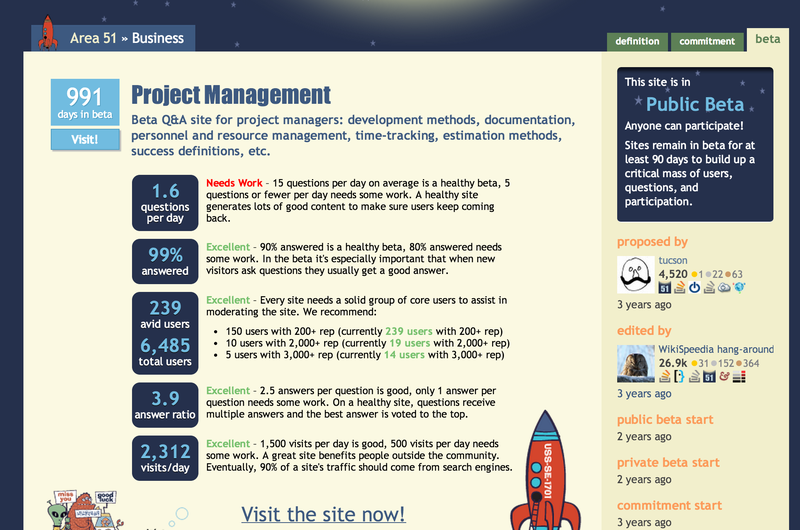 It's built and run by you as part of the Stack Exchange network of Q&A sites. 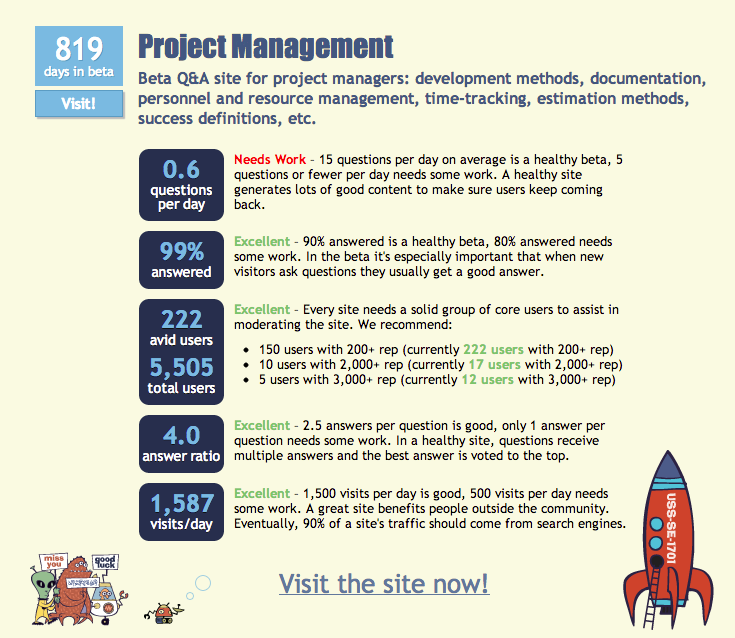 With your help, we're working together to build a library of detailed answers to every question about project management. As you can see, visits per day has more than doubled since May. Our questions per day, which historically has been less than 1.5 questions per day, has also increased to over 3 questions per day. This is really good news that we're experiencing growth, but it also means more users with privileges to help maintain the site will need to step up and use those privileges. Voting also plays a key role in uplifting other users and introducing new blood into the community. Thus, we should upvote useful content and downvote content that isn't useful. Each user with at least 15 reputation can vote 40 times per day, which can help increase the number of editors and close/reopen voters. One thing I've noticed, being a moderator on multiple sites, is that the users who participated in the site's early days don't always stick around later on. This is why voting is so important. Voting is an important component to a healthy site. I'll be honest, the growth sort of took me by surprise. Generally, I check in, read the one question and answers posted for the day, do some editing and voting, and then move on. But with 3.3 questions per day, we'll all need to be a little more active in terms of keeping an eye on things. Stack Exchange has appointed additional moderators on beta sites in the past, if there is a need. However, before approaching the community management team, I'd like to see our community step up in terms of participation in the process. This isn't limited to just editing but also doing what it takes to meet our goal of being a library of knowledge about project management. Tomorrow is our site's three year anniversary since beginning public beta. Let's use this as an opportunity to make changes for the better. Let's get more people to drop into The PMSE Notice Board. Let's leave comments helping users improve their posts. Let's edit to fix spelling and grammar to really make things look professional. Let's try stepping up our game for the next six to eight weeks. If after some time we still feel like more moderation help is needed, we can bring the community managers into the conversation. To everyone out there who has created great questions and answers, and to those of you using their moderation privileges, thank you. We've come a long way since February 2011! Does our site need active editors? Project Management self-evaluation: let's get critical! How to prevent spam answers on questions that ask about products but are borderline recommendation questions? Are moderators able to move comment threads to chat?